Suffolk County Sixth Precinct police officers rescued an elderly man who became stranded in a flooded road in Coram this morning. Coram, NY - August 13th, 2014 - Suffolk County Sixth Precinct police officers rescued an elderly man who became stranded in a flooded road in Coram this morning. Officers Thomas Wilson and Matthew Detleff were on northbound North Ocean Avenue conducting traffic control and diverting motorists due to extreme flooding, when a motorist apparently became disoriented due the road closure. Anthony Monticciolo, 86, of Centereach, drove his 2008 Subaru into the flooded roadway and his vehicle immediately became disabled. The water was approximately 6 feet deep and began filling the Subaru. Monticciolo was unable to exit the vehicle. Officers Wilson and Detleff waded into the flooded roadway and then swam to the victim's car. They removed Monticciolo from his vehicle and brought him to safety. Selden Fire Department personnel examined Monticciolo who was not injured. 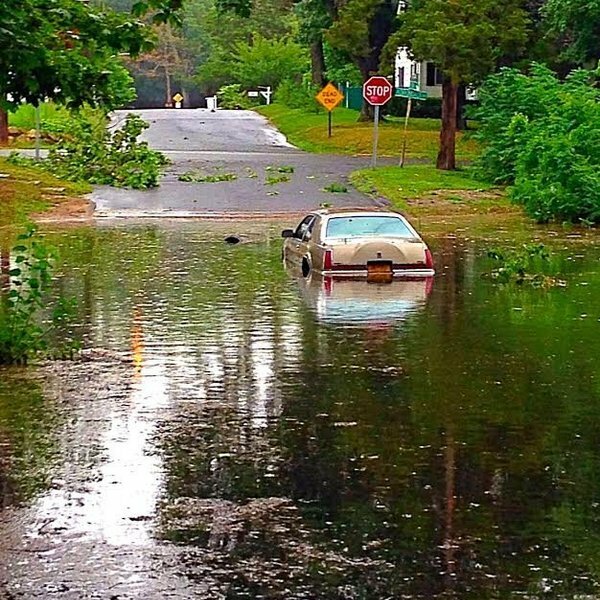 Pictured: Heavy flooding in Selden on August 13th, 2013. Photo courtesy of Margaret Ann Photography. Subject: LongIsland.com - Your Name sent you Article details of "SCPD Officers Rescue Elderly Man after Vehicle Becomes Disabled in Flooded Road"